This is a picture of four friends. We four friends went to Auburn together. We were all Chi O's together. Jenny, Rose Lynn, me and Rachel. And now, one of the four friends is about to have a new last name. I'm southbound tomorrow for Jenny's big day on Saturday. I can't believe it's finally here! 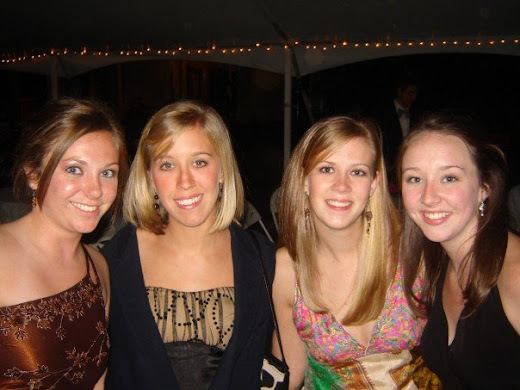 I remember sitting in Mollie Hollifield in Spring of 2007 in Jenny & Rachel's dorm room trying to help Jenny think up a clever way of asking Andy to our Chi O formal (because Chi O's always seemed to ask their dates in a fun, creative way...). She ended up dropping off a huge care package for him at RBD library one night while he was studying, the basket was full of candy and clues to what she was inviting him. And...now they're getting hitched! My, how time flies when you're having fun. I'm so excited to celebrate these two on their special day! In "auburn", "friends", "weddings", "weekend"